Pressure Cooker Moroccan Lemon Chicken with Olives is infused with Lemons, Fragrant Spices and Salty Green Olives. Take a trip to Morocco with me. This is a “dump and push start” meal, as well as Low Carb, Keto, Weight Watchers friendly! My college roommate, Mariah, was born in Morocco. Cool, huh? Our second year of college, we lived off campus in the “theatre” house, with two other roommates, Dean and Graham. Dean was into stage construction and Graham was also an actor, frequently as a leading man and paired with Moriah. Our other would-be roommate, Steve, was killed from an electrical accident, shortly before he was to move in. He had a Summer gig in Missouri, I think and was on a ladder fixing the lights. Moriah had (and still has) a beautiful singing voice. She was cast in all the ingénue rolls at the University of Florida. This Pressure Cooker Moroccan Lemon Chicken with Olives is dedicated to my friend, Moriah, who is now a big wig in a Florida school, directing teaching acting. 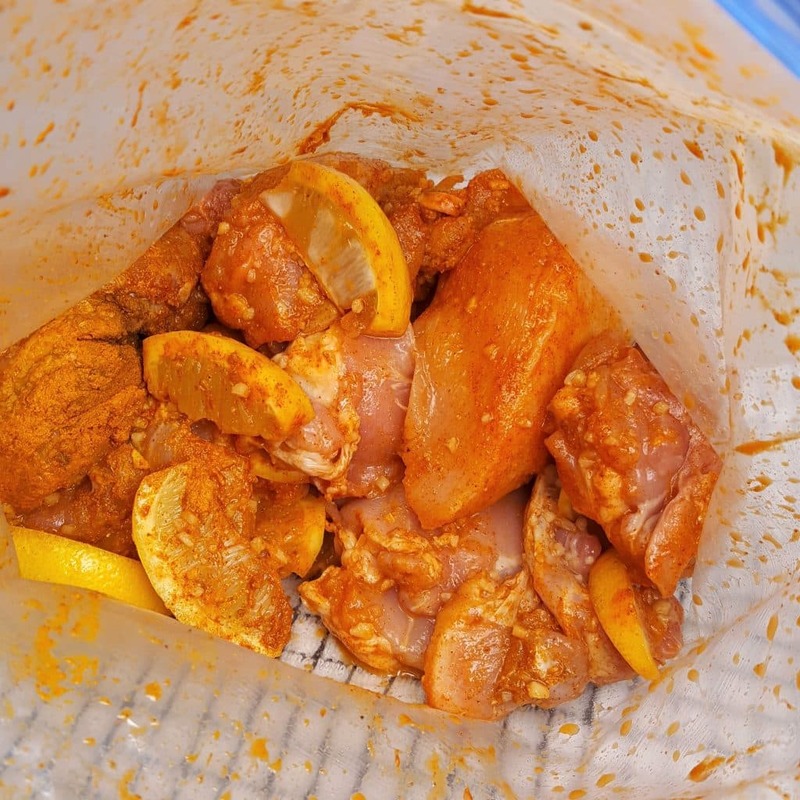 Pressure Cooker Moroccan Lemon Chicken with Olives is a “dump and push start” recipe. Most ingredients are Pantry Staples. 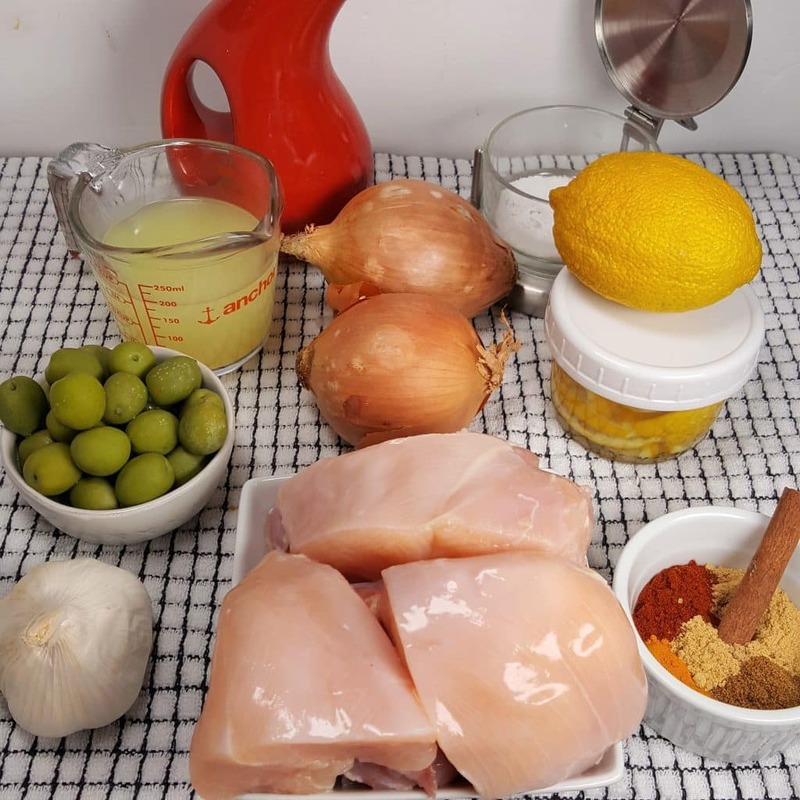 What ingredients are in Moroccan Lemon Chicken with Olives? Preserved Lemons work really well here, but plain old Lemons can be used, if you don’t have Preserved. They are Lemons which have been sliced or quartered and kept in a Glass Mason Jar with salt. They are first cut and packed into a Glass Mason Jar, with Salt added between each layer. They are tightly packed and pressed into the jar, so that the juice is extracted. After storing for a week on the counter, they are then moved to the refrigerator. When the peels become translucent, they are ready to use. This takes about a month. The flavor of the Lemons are less tart and salty. If you do not have Preserved Lemons on hand, cut up Lemons and add some Kosher Salt to the marinade….but make some Preserved Lemons for next time. For a bit more Lemon Flavor, I added a few pieces of plain Lemon to the Marinade. This helps to tenderize the chicken and keep it juicy. For this recipe, I used Chicken Breasts and Chicken Thighs. So that the Chicken would cook evenly, I cut the Thighs smaller than the Breast, which I only cut in half. 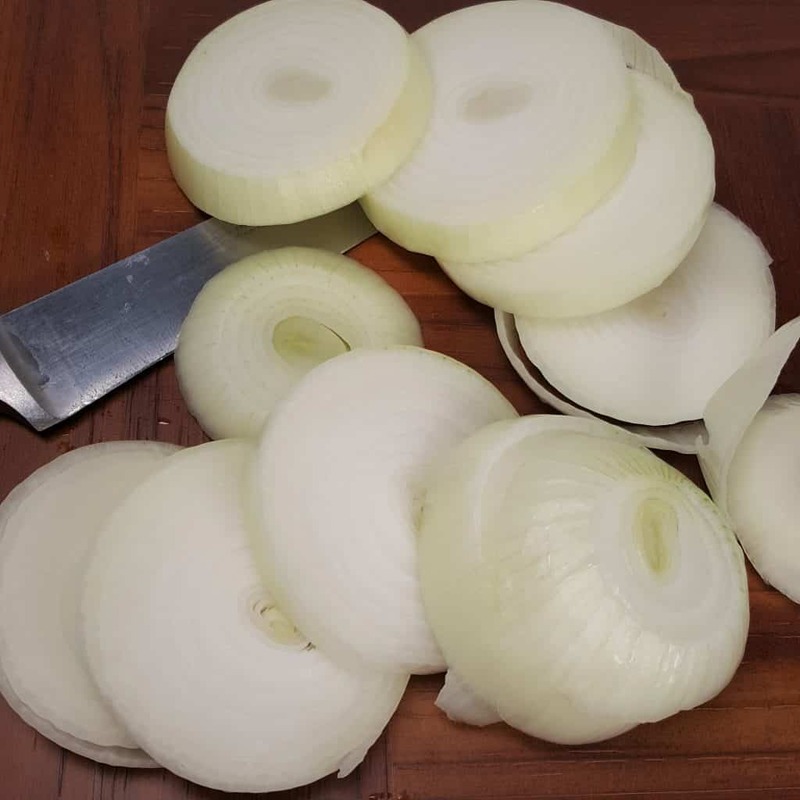 The Onions will cook very fast and in order to prevent them from completely disintegrating, cut them nice and thick! We’ll cook down the liquid a bit at the end and let the Onions thicken the Sauce. Make sure to use a good and sharp knife when cutting. Add the Onions to the Container or Baggie with the Chicken Pieces and the Marinade. This is an easy Freezer Meal, as you can do all the prep work and package up the Chicken and Marinade and use your Foodsaver and store the package in the freezer. Another really good and flavorful recipe to try is my Pressure Cooker Balsamic Garlic Chicken. It also is great for a make a head Freezer Meal. 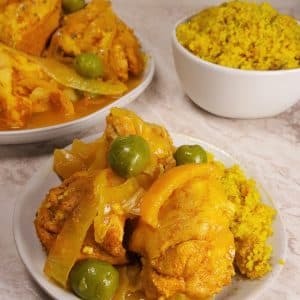 How do you make Moroccan Lemon Chicken with Olives? 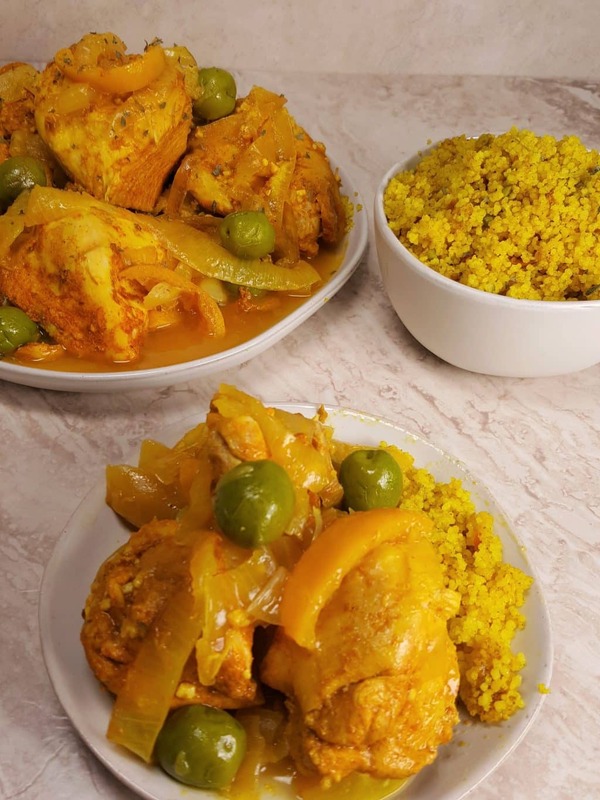 Moroccan Lemon Chicken with Olives is commonly made on the stove in a Cast Iron Skillet or Dutch Oven. It is also cooked in a Traditional Tagine or can be slow cooked or slow roasted in an Oven. The process for cooking on the Stove is slow. The Preserved Lemons are added at the end, while thickening the Sauce. It gives the Sauce a Salty and Lemony flavor. In order to use the Instant Pot, Mealthy MultiPot or Pressure Cooker, we’ll do things a bit differently. Pressure Cooker Moroccan Lemon Chicken with Olives takes a fraction of the time and is equally as delicious. Try to push the Onions to the bottom of the cooking pot, to keep the Chicken off the bottom. 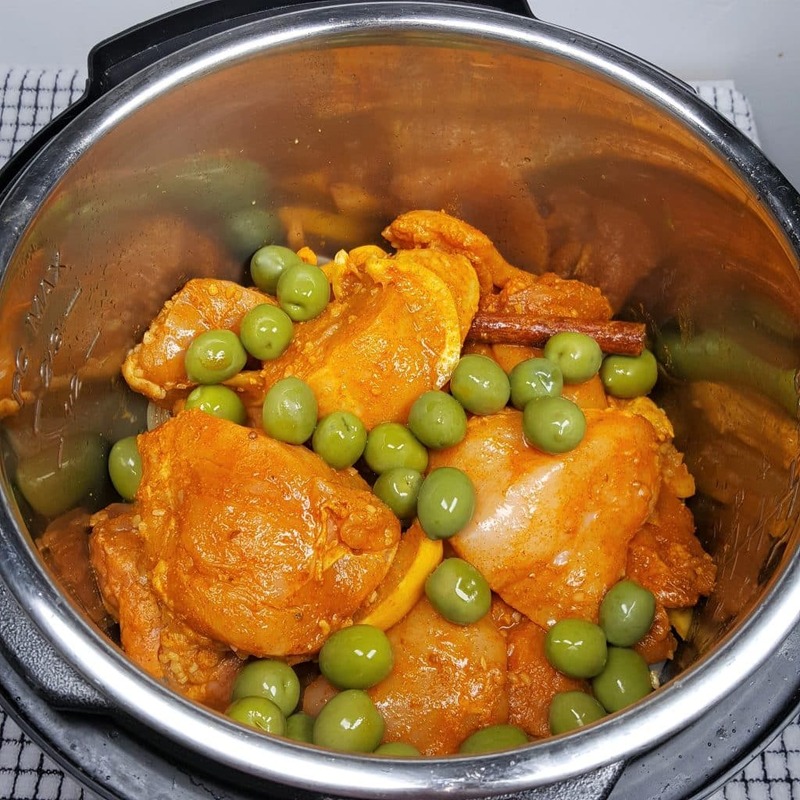 If I were cooking this Pressure Cooker Moroccan Lemon Chicken with Olives recipe on the Stove Top, I would add in the Green Olives, after the Chicken is cooked. There is a longer Simmering Process, so that would help incorporate the flavors. For this Instant Pot, Mealthy MultiPot or Pressure Cooker, recipe, I’ve chosen to add them in right away. We will only need a short simmer, so, better to add the Green Olives in with the Chicken. 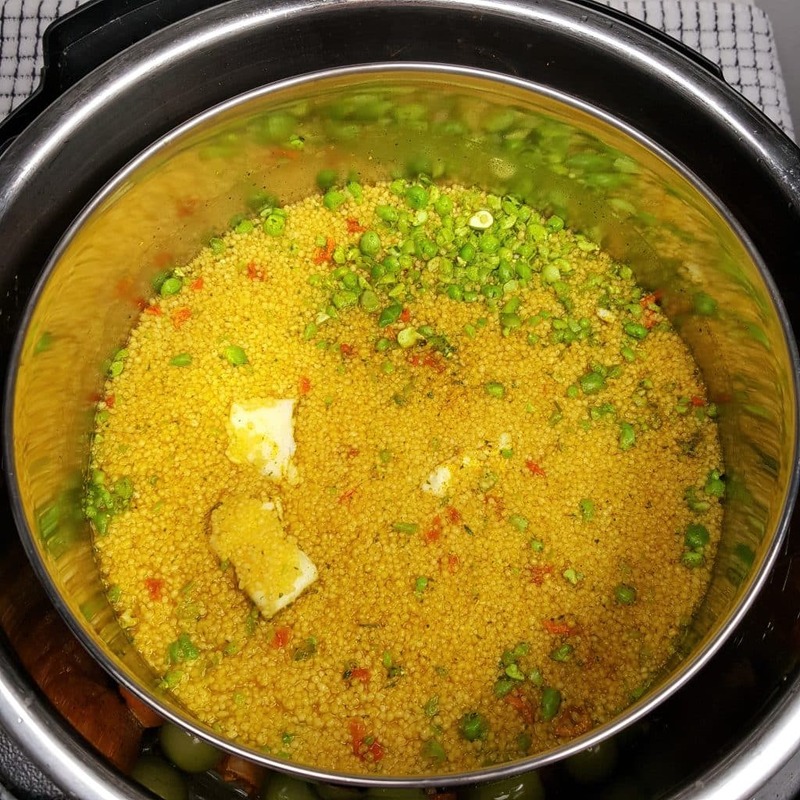 Cooking Couscous at the same time as my Pressure Cooker Moroccan Lemon Chicken with Olives is so simple. There are a couple of Couscous recipes in my This Old Gal Pressure Cooker Cookbook, which is available now for pre-order. The Stainless Steel Stacking Pan Inserts come in two tiers or three. My recommendation is the Ekovana Stainless Steel Pressure Cooker Stackable Pans Set, which is good for either larger or smaller portions of Pot in Pot Rice, Potatoes or Couscous. Both have the optional lid with the steamer holes and both have a solid lid! 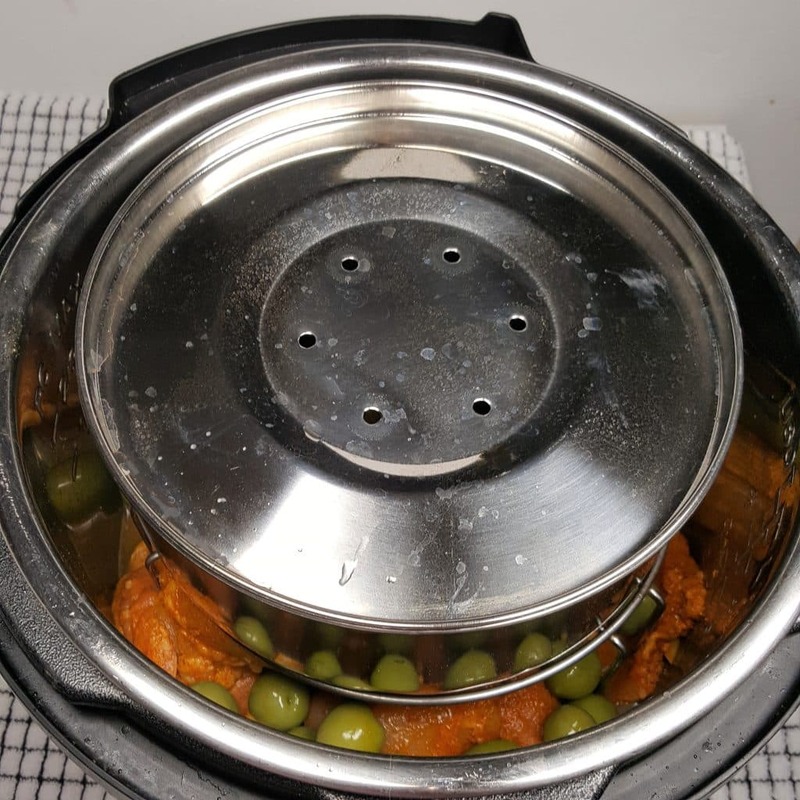 Besides using the Stacking Pans for this Pressure Cooker Moroccan Chicken and Olives recipe, I use them in my Pressure Cooker Choco-Spice Layer Cake recipe and my Pressure Cooker Grandma’s Egg Custard recipe. The Onions will further cook down during the Simmer stage. Serve over Pressure Cooker Mashed Potatoes, Pressure Cooker Couscous (in my book), Pressure Cooker Pot in Pot Rice, Air Fryer Simply Delicious French Fries (popular in Moroccan restaurants. 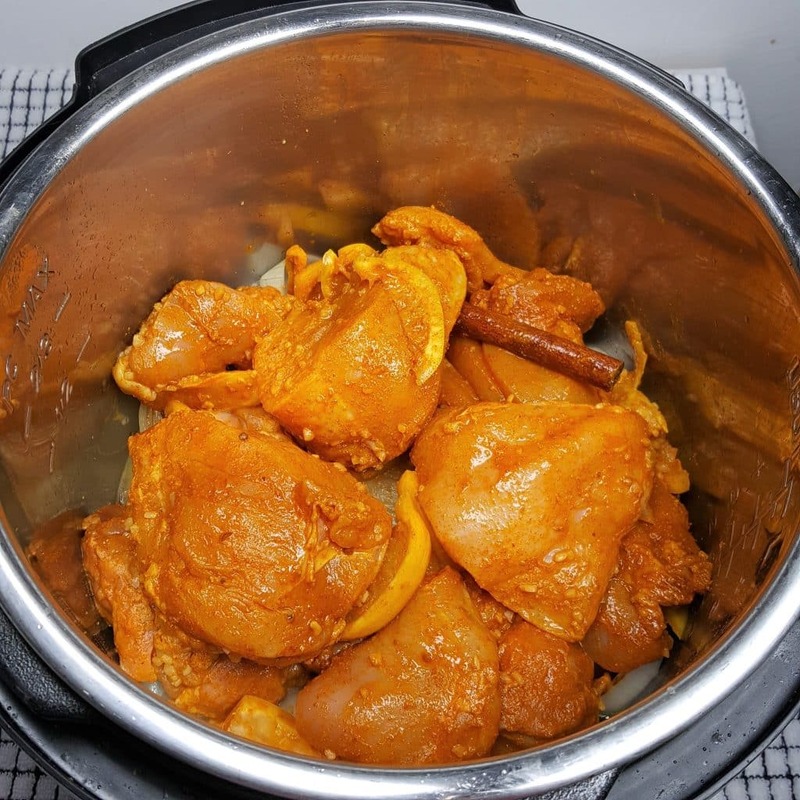 My Pressure Cooker Healthy Carrot Potato Mash is really good with this Chicken Dish too. di Oro Living Silicone Spatulals Set! Trim fat from chicken and place in Container or Baggie. Add all ingredients to Baggies, except Olives. Allow to marinate in refrigerator for 30 minutes or overnight. When ready to cook, dump contents of Container or Baggie into Pressure Cooker cooking pot. Add 1/4 cup Chicken Broth and Green Olives. Remove the Chicken to a plate. Select Saute/Browning and Simmer until Onions have become mush, about 5 minutes. Return Chicken to Pressure Cooker to reheat. Serve Chicken with Onion Sauce, Olives and Lemons. If you do not keep Kosher, you can omit some of the Oil and add in a bit of Butter at the end, to help thicken the Sauce. *If you do not have Preserved Lemons, cut up 1 regular Lemon and add 2 teaspoons of Kosher Salt, or more to taste. For even cooking, cut Breasts in half and cut Thighs in thirds. You mentioned adding the preserved lemons at the end but in step 1. say to add everything but the olives to the chicken? I am interested in an answer to the same question. Are there answers to these questions in another location? I think that there are a few discrepancies in the recipe that could be clarified, as in the questions above (or below if that is the direction the program prints). Small typo in recipe Jill. Are we to use 1/4 cup, or 1/2 cup of broth? Will this suffice to bring the IP up to pressure? I am interested in a response to the same question. I had no problem with my 8qt pot reaching and keeping pressure. Instant pot company says for an 8qt pot it takes a minimum of 2cups of water/liquid to reach pressure. I don’t think 1/4 or 1/2 cup of broth is enough. Is it? I just made this in my 8qt pot and it reached pressure and kept it just fine. so the chieken cooks on pressure only 6 minutes (and however long it takes to let out the steam?) and is it okay without the olives? For the people asking I have cooked this twice and used 1/2 cup stock in the marinade and that’s it and it is bloody beautiful. Ok, I made this a second time in my ip. This time, I used the chili paste, I didn’t put in the preserved lemons or olives until the chicken was out and it was time to reduce the sauce. It came out much better second time round. Can’t wait to try this! Maybe the Pressure works because it cooks for only 6 minutes?? Hi quick question, if making as a make ahead freezer meal, do you add the olives to the freezer bag OR wait to add them at time of cooking? ?